By the time I started working for Woolworths, the company was pushing its in-store ordering system big time. In Summer 2006 The Big Red Book was launched to encourage customers to make use of the ordering facility. As sales assistants, we were always encouraged to offer to order any items that weren’t in stock. Unfortunately, the ordering system was, in my view, a customer satisfaction minefield. The system was slow, clunky and difficult to use. Worse still, the majority of times I checked for an item, it wasn’t in stock and it wasn’t available to order (latterly, it was actually a surprise if an item was in stock). Customers would often raise an eyebrow and say, “I thought you were ordering it because it wasn’t in stock.” No such logic in the Woolworths system. And the flat £4.95 charge for home delivery simply wasn’t worth it for smaller items. The catalogue also raised customers’ expectations about what they could find in store. A customer would browse the catalogue at home, and expect to be able to find every item they wanted in store. Not so, of course — that’s why they produced a catalogue in the first place. But there were a lot of disappointed customers. During my stint at Cumbernauld there was a problem soon after the price of pic ‘n’ mix increased. It was still being advertised in the catalogue at the lower price, and the customer demanded to be charged the lower price. I know of at least one other similar incident with another product. The company seemed to forget that producing the catalogue meant they couldn’t really increase any prices. The Big Red Book experiment was an inept attempt to beat Argos at its own game that was doomed to fail. I have heard that the experiment was ultimately an expensive disaster, and that the ordering system was one cause of the stock availability problems. The catalogue was scrapped in late 2008 (but not before the company had already produced not one but two Christmas 2008 catalogues), but the damage had already been done. The whole adventure is ironic given that Woolworths was an early player in the catalogue store format with its Shoppers World chain. Woolies gave up on it in the 1980s. Maybe if they persevered they would never have had to worry about Argos. Smarty-pants analysts like to point out that retailers need things like catalogues and high online sales to survive. But where is Poundland’s online ordering system? I notice also that I can’t buy my food shopping on the Aldi and Lidl websites. Yet these three stores are all in rude health, and are expanding as though the credit crunch never happened. That’s because they focus on providing goods that customers want at low prices — not producing costly catalogues. It’s highly notable that those currently well-performing stores are all value retailers. Once upon a time, Woolworths would have been seen as a value retailer. Somehow it took its eye off the ball. Woolies was neither a place where you would be sure to find value-for-money bargains, nor a place to buy high-quality goods. Instead, it uncomfortably took a path in the middle — a retailing no man’s land. In fairness, the launch of the WorthIt! brand was a good stab at offering value-for-money products, and the value was indeed often impressively good. Unfortunately, this sometimes seemed to be at the expense of the main range of products. 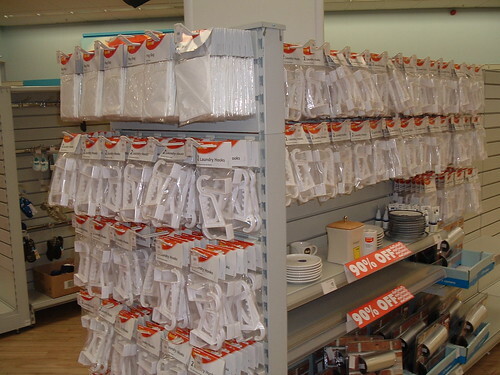 For instance, you could always find a better range of stationery in WH Smith (even if it was more expensive there). But alarmingly, the range at Woolworths seemed to get worse since I started working there. Of course, some products had to go to make shelf space for the WorthIt! range. This meant that I could buy sets of WorthIt! notepads that were undoubtedly excellent value for money, but they weren’t quite as good as my preferred kind of mini notepads that disappeared from existence. Meanwhile, can you believe that latterly we did not sell such basic stationery equipment as a tape dispenser? I only realised this because a customer asked me if we stocked them. I instinctively said yes (of course we do!) only to lose the spring in my step once I had led my customer to the stationery area, realising that I had not seen one in yonks. Boy, did I feel like an idiot. There were few signs that the product range was going to improve from 2009 onwards. Among the last new products that arrived was a dummy CCTV camera. This must have been designed to be put on sale after the Christmas period, the tell-tale sign being that they came in with half price stickers plastered all over them when they were not yet half price. Unfortunately, at full price these plastic pieces of crap that literally did nothing (the only feature of this plastic, fake CCTV camera, was a blinking LED) sold for well north of £20. Customers did not touch them with a bargepole, even when the store-wide discount sat at 90% off on the final day. There they are on the bottom-right of the above photograph along with a million and one WorthIt! laundry hooks. These were among our unsold products after the shutter went down for the final time on Tuesday. In fairness to the laundry hooks, they probably sold fairly well. The only reason we had loads left was because the distribution centre sent us way too many. By that time, crisis mode was well under way, and clearly the distribution centres’ only aim was to get rid of all the stock, just chucking stuff on cages and waving goodbye. Another of the final new products to arrive was a set of four crocus vases with crocus bulbs. Not a bad product in and of itself. The problem was that the packaging was shockingly bad. There was next to no protection for the individual vases, meaning that they rattled around inside the box, clattering against each other. This sometimes damaged not only the vases but the bulbs as well (which just sat loose on the top of the vases). If a box was dropped, it was curtains. Worse still, the boxes came with a huge display window. Not so unusual, except for the fact that it wasn’t so much a window as a massive hole in the box. Unprotected by any kind of cellophane covering, it didn’t take too much jiggling for a vase to “accidentally” fall out of the box. A shoplifter would have had a field day with these, simply being able to inconspicuously reach in, grab a vase and pocket it. The packaging was so poor that the whole lot ended up being scanned off the books. We took the surviving vases out and sold them separately, sans crocus bulbs, for 30p each. But what a load of money that must have gone down the drain, and all for some thoughtlessly bad packaging!